I’m very excited that in just two and a half weeks, on September 12th, the next book in my Arcadia Valley Romance Baxter Family Bakery series will release! The Baxter family bakery, called A Slice of Heaven, is run by three brothers (Jonah, Micah, and Malachi) who, along with their sister Ruth, moved to Arcadia Valley, Idaho, to start a new life. If you’ve been keeping up with the multi-author series set in Arcadia Valley, then you’ve already met Ruth (in Loaves & Wishes, a novella that’s part of Romance Grows in Arcadia Valley) and Malachi (in Muffins & Moonbeams, which released in March of this year.) Now, it’s Micah’s turn to find love. I had a lot of fun writing Serena. I generally tend to stick with characters who might live next door to me. You know, the average, everyday kind of person. And that’s really what Serena is trying to be. She just happens to have run away from Hollywood to try to do it. Even with her background, I think Serena ended up being a fairly down-to-earth gal, and Micah is just the right guy for her. She just has to convince him of that. Micah shook his head. He ought to leave. Just walk back out the front door, get in his car, and head back to the book that was waiting for him by the cash register. Except…he could hear Jonah’s chiding voice in his head. A big order like this one—without even a flinch at the extra charge they’d added for last-minute prep and delivery? Serena Johnson was the kind of customer they needed to keep happy so she’d think of them again when she had…whatever kind of party this was. Cookies & Candlelight is available for pre-order on all e-book platforms and will release on Tuesday, September 12th. You can find your preferred version on the Arcadia Valley Romance website. Cookies are part of what brings Micah and Serena together. It starts with maracons, but there are snickerdoodles in there, too. Both are favorites of mine. What’s your favorite kind of cookie? Hi Wemble. ANZAC bickies are delicious. Love learning about Australian culture. 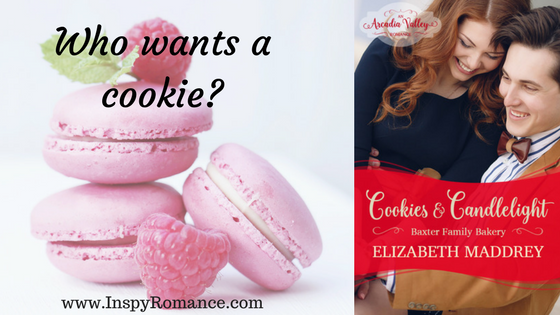 Hi Elizabeth, enjoy reading your Arcadia Valley Romance Baxter Family Bakery series. Yes, most bakeries are A Slice of Heaven. As a teen I work in a bakery and savored their coconut macaroons. My favorite cookie is Quaker Oats Vanishing Oatmeal Cookies. Half the family enjoys those and the other half enjoys Toll House Chocolate Chip Cookies. Snickerdoodles and peanut butter cookies are also tasty treats. Mmmm- Cookies and Candlelight is preordered and anxiously awaited by this reader. Thanks for the tasty topic. My boys enjoy helping me make the Quaker Oats cookies. And Toll House chocolate chip. They’re definitely favorites around here. Thanks for pre-ordering! I hope you enjoy it. Thanks for sharing a great excerpt! I will definitely have to check on this one! Thanks for sharing the excerpt! Sounds really good! My dad’s favorites are snickerdoodles. They’re fun to make, too. Cookies? Bakery? You’ve got me hooked! :-) My favorite kind of cookie is chocolate chip. I prefer using milk chocolate chips instead of bittersweet! Your story sounds wonderful! Looking forward to reading it! Thanks, Cecelia. :) I’ll often mix different chocolates in my cookies as well – the variety keeps it interesting. Another chocolate chip fan here. They’ve always been my favorite! Looks like a great story! And probably one you cannot read on an empty stomach! Fun scene. My favorite are definitely chocolate chip but honestly I’m usually just as happy to eat the dough as the baked cookies. I’m so glad someone mentioned cookie dough. Yum! I just finished writing a Christmas novel, so the cookies on my mind are cinnamon swirls, peppermint mocha pretzels, and gingerbread men. But I could get in line for some snickerdoodles!!! Valerie Comer! Will the recipes for your cookies, especially the cinnamon swirls be in an upcoming book. Would love to make them for my family. Also love baking gingerbread men. Hmm. I hadn’t planned to, but there’s an idea! I just double checked my website and, while the recipes for mocha peppermint pretzels (which are pretzel-shaped cookies, not actual pretzels) and gingerbread men are there, I’ve never posted the cinnamon swirls recipe. Will have to remedy that! Thanks Valerie! Will check ou your website! Ooo, great excerpt. I have already preordered the book, and am really looking forward to reading it. Love the line, “Do I look like an 80 year old British woman?” I’ve got the book pre-ordered. And snickerdoodles are pretty high on my list. I rarely make them because I eat too many of them. The ones I make most often are oatmeal chocolate chip, peanut butter, and persimmon (we have our own persimmon tree). We have a lot of snickerdoodle fans! I LOVE LOVE LOVE Snickerdoodle cookies! They are my favorite, but I will say, I don’t think there’s a cookie out there that I don’t like. Elizabeth, sounds like a fun story. Chocolate chip are my favorite with oatmeal raisin coming in a close second. Snickerdoodles are amazing! But I think my favorite is White chocolate macadamia nut cookies! Ooh…I love macadamia nuts in cookies — yum! I love buttery shortbread cookies, fresh out of the oven! And with a cup of hot coffee. Oh. Yeah. I really want a cookie and some coffee now! Thanks! You know, I’ve never had a no bake cookie. I’m going to have to look those up! I really like chocolate chip and peanutbutter cookies. I like almost any cookie, especially if it has chocolate. A friend just visited and brought chocolate chip cookies with her for us😁!! I’ve been patiently waiting for this book. I saw the pre-order was up sometime last week. Now I just need to wait a few more days. I still think it’s not fair that Jonah met his match first and he’s going to be the last one to have a happy ending. I’m just too curious to see what you’re going to do to explain why they’ve been “together” but not really during all this time. Malachi is definitely a favorite since book 1, then I got to see a bit of Jonah in book 2, and I just didn’t get enough of Micah in books 1 and 2 to wonder anything about him.. I like the back cover though. Love oatmeal/raisin….picked some up at the deli today! Can’t wait to read your new book! i enjoyed the excerpt. It sounds like a great book. My favorite cookies are peanut butter oatmeal chocolate chip. I like to make them and vary the kind of chocolate chips. Thanks, Pam! Peanut butter oatmeal chocolate chip is new to me and wow…they sound yummy. Favorite cookies would be Oatmeal Chocolate Chip. The excerpt of the book sound wonderful. Can’t wait for it to come out. One of my favorite cookies is peanut butter cup cookies. I’m excited to read this new book soon! Those sound amazing. I need them in my life. You are not alone in loving PB! But I have never thought to put PB on a chocolate chip cookie! This looks like a GREAT book! Funfetti cookies are my favorite. Thanks! Are those cake mix cookies? I have a friend who makes cake mix cookies all the time and they are delicious. I make mine from scratch, but I’ve been wanting to try making them from a cake mix. Reading the posts make me hungry for cookies !! !